Rice Paper Wrappers are used to make both fresh and fried spring rolls from. 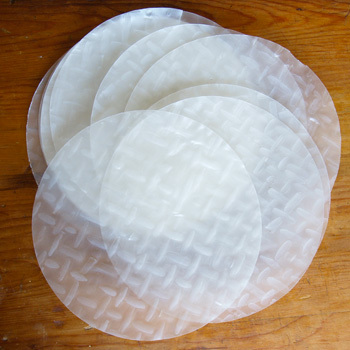 They are fragile, almost see-through flat sheets made from a dough made from rice flour. You can buy them in round, triangular and square shapes. They range in size from 6 to 14 inches, but the average is about 8 inches wide. In making Rice Paper commercially, a bit of the previous batch is added to the new batch to give it just a slightly sour taste. Rice flour is mixed with water, the dough is rolled out, cut, then steamed and dried. When fried up for fried spring rolls, the white Rice Paper Wrappers take forever to brown, and sometimes never do. Manufacturers in Vietnam are now making brown Rice Paper Wrappers. They’re not brown because they are made from brown rice flour, but rather because they have a small amount of caramel colouring in them. They start off slightly brown, and get browner as the caramel — well, caramelizes more. Most white ones come from China; the brown ones are only being made (as of 2004) in Vietnam. Recently, in Vietnam, commercial manufacturers have also started adding tapioca starch to the dough, which helps them make thinner wrappers, but this makes the wrappers a little harder to work with. Some believe that Rice Paper Wrappers are only meant for fresh spring rolls and are not used for fried spring rolls, but in fact the Vietnamese use Rice Paper Wrappers a great deal for their fried spring rolls. Dried ones should be dipped in lukewarm water for 2 or 3 seconds first, then let sit to become soft. Don’t oversoak or they will dissolve. Rice Paper Wrappers with tapioca in them should be just dipped in cold water instead. To help the white Rice Paper Wrappers brown better for fried spring rolls, put some sugar in your dipping water. Store dried ones in an airtight container because otherwise they will readily absorb moisture in the air. Called “Baùnh tráng” in Vietnamese. “Baùnh” in Vietnamese means “rice”.